After departing Darwin midday we will head east along the Arnhem Hwy to Fogg Dam here is an introduction to the birdlife on the floodplains of the Adelaide River. Also at the Adelaide River, a crocodile encounter, on a one-hour boat cruise you will see the power and genius of these prehistoric creature that also call Darwin home. Continuing on the Arnhem Hwy we then head into Kakadu via the Old Jim Jim Road heading towards our accommodation in the centre of Kakadu – Cooinda Lodge. 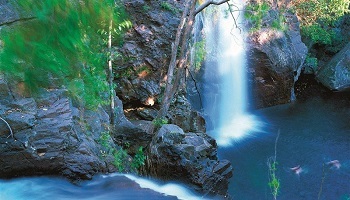 Today we head to the Southern hills and ridges region of Kakadu National Park to visit the iconic Gunlom Waterfall. These falls were made famous in the movie Crocodile Dundee and has the most amazing swimming holes with a view after a short but steep climb to the top. Returning to the bottom of the hill to the small sandy beach on the fringe of the paperbark forest we can cool off in the large plunge pool filled with a variety of fish. After a picnic lunch we will return north to Anbangbang. This Aboriginal Rock art site is one of Kakadu National Park's most famous Aboriginal rock art galleries where we will see one of the most astounding displays of historic art dating back to a possible 45,000 years. At the galleries you will see representations of the many animals the Aboriginal people hunted, as well as important dreamtime ancestors such as the Narbulwinbulwin and a Narrmagon the Lightning Spirit. From here to Cooinda for a sunset tour on the majestic Yellow Waters Billabong. 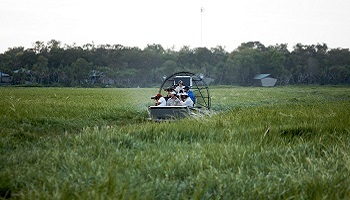 This cruise is the best way to encounter the vast wetland ecosystems of Kakadu. The wetlands contain at least 60 species of birds. The birdlife is immense, especially at his time of year when the landscape is waiting for rain and the animals begin to congregate around the last remaining water holes. The billabongs play host to a variety of species; from crocodiles to sea-eagles and water pythons to osprey. Tonight we camp out, in dome net tents with swags (A swag is a typical Australian bedroll. ), at Mardugal Billabong and after a campfire cooked dinner we will sleep looking up at the stars whilst the possums quietly play. Today’s destination is the beautiful Maguk Waterfall. Here we walk through one of six Kakadu ecosystems following the freshwater creeks through the Monsoonal Rainforest, a favourite stopping ground for pitas and parrots. We will wander into a short, but steeply sided gorge that finishes with a 40 foot waterfall. Barramundi creek, unlike other river systems in Kakadu, doesn’t dry out in the late season. Instead it is continuality spring fed and therefore the aquatic life is astounding and a cool, clean, refreshing swim waits at the end of the walk. A picnic lunch is followed by a drive to Swim Creek Station on the Mary River wetlands. Tonight’s accommodation is at Bamurru Plains in a deluexe cabin. The day breaks to the tune of the whistling of the kites and the thumping of Agile Wallabies hopping by your habitat. 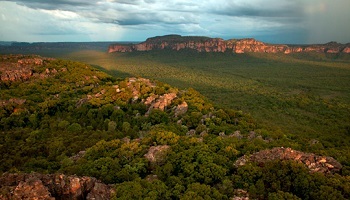 Bamurru Plains is Australia’s answer to the Okavango Delta, located on a 300km² of private buffalo station, just west of the Kakadu National Park on the Mary River floodplains. Bamurru invites guests to share in a profusion of bird and wildlife right on their doorstep in a unique bush camp that exudes ‘Wild Bush Luxury’ and brings a touch of style to the discovery of a remote and beautiful wilderness. The wildlife on show in this wilderness is some of the most impressive in Australia, and our expert field guides are the keys to unlocking Bamurru’s wild secrets. Watch hundreds of birds take flight from around the infinity edge pool, or slowly cruise down the Sampan river looking for crocodiles along the bank. Guided walks and open top 4WD safaris will take you out to the further reaches of the property on the lookout for wild brumbies, dingoes or a perfect Top End sunset to watch while enjoying canapés and a sundowner drink.